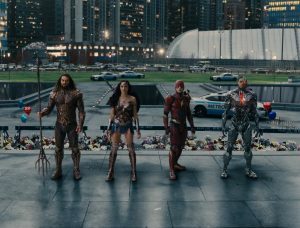 They are joined by “Game of Thrones’” Jason Momoa, who was briefly seen as Aquaman in last year’s “Dawn of Justice,” as was Ezra Miller as The Flash and Ray Fisher as Victor Stone/Cyborg. The cast spoke at a press conference about joining forces in this newest outing in which they are called upon to save humanity from Steppenwolf (Ciaran Hinds) and his army of Parademons after Superman has made the ultimate heroic sacrifice in last year’s “Dawn of Justice.” The film is directed by Zack Snyder from a screenplay by Chris Terrio and Joss Whedon. Q: How did everybody feel when the whole gang was first together and costumed? Momoa: I’m a big kid and I kind of geeked out. I was walking around Ben (Affleck) and pulling on his cape. It’s just surreal that I’m even here playing this guy. You’ll see us all out there (together) and you’ll feel the same way. Affleck: And I was like “Who is pulling on my cape? Gadot: I think it was surreal for me coming to set and seeing everyone in their costumes. I was just observing everything. Then, I started to laugh to myself. It was surreal and crazy. Affleck: In these movies that have a lot of effects and green screen you have to use your imagination a lot and it was really great to be around all these great actors dressed the way they’re dressed looking so cool and inspiring. It felt considerably less ridiculous. Miller: On the day, everyone’s like, “Oh, I’m so hot in this suit.” Just kidding. It was a joyous, amazing experience. I’m a big comic fan too so when everyone got together, it was like looking at a frame from some of the early “Justice League” comics because we have so many of the original characters. Everyone except for Cyborg, just because he hadn’t been invented yet. 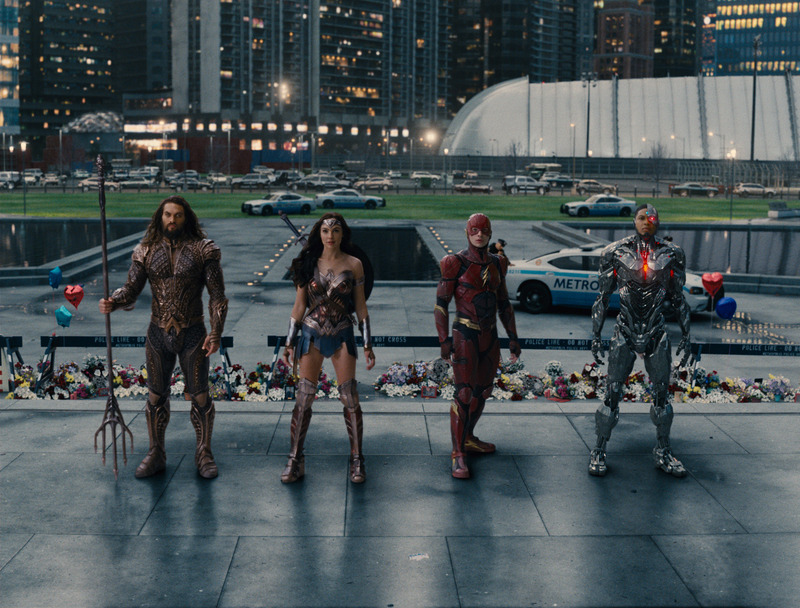 Everyone was in the original Justice League, even Superman who we hope is in this one too. Cavill: On the days I went to visit set, because I’m not in the movie, I was lucky enough to see all these guys lined up in costume, it’s been six years since I started on this (Superman) journey and during “Man of Steel,” I never imagined I’d be sitting up here with these other superheroes. They are superheroes in the movie and superheroes in life and I consider it an honor to be sitting at the end of this line. Thank you guys. Miller: That is so sweet! Q: Did everybody take selfies? Affleck: They frowned on selfies. You had to leave your cell phone outside. It was not cool to take selfies. Cavill: Batman is the only one with pockets anyway. Utility belt. Miller: I did steal stuff from the Batcave though. So did Jason. Momoa: These bullets with a little red cap on them. Q: For Ray, your character is the only one who perceives his powers as sort of a curse rather than a blessing. Can you talk about Victor moving from feeling that to embracing a heroic destiny? Fisher: In a lot of ways, Cyborg is super reluctant to join the team because of the trauma he’s had due to his accident and the fact that he can’t live a normal life the way these other members can. He can’t take off his costume and walk the streets and take on a different identity. He’s both Victor Stone and Cyborg 24/7. Balancing the duality within oneself was a very interesting process but we (Fisher and filmmakers) had a lot of time to talk about the character and I had a three year lead up time process on this character for this film to become part of a team again the way he was when he was a football player. Q: Jason, can you talk about Aquaman in the film and leading to his solo film? Momoa: You’re going to understand where he came from, about his mother and father and how he was treated in this world and didn’t know how to use his powers. Sometimes he saved people, sometimes he lost them and his human side didn’t know how to cope with those things. There’s a lot of layers to this guy and I think once we get to the Aquaman solo film you’ll see the man who is going to take responsibility, help the world and become King eventually. In this one I don’t think he’s (full) Aquaman yet. Just stick with it. Q: What kind of team-building work did you guys do to bond for this film? Did you train together? Fisher: I think a lot of it is the time we got to spend between takes. Being around these guys with different energies and different comedic sensibilities, I think that did build the team in a pretty organic way. Gadot: Zack did a great job of casting, picking which (actor) would be the best for the character and how the whole would work together so it’s been super easy. It’s been very natural. No hours on the psychologist’s sofa talking about each other. It’s been super fun and very easy. Momoa: We all spent a lot of time on set. I have massive ADD (attention deficit disorder) and I can’t sit still so I’d usually go back to my trailer but on this we were all together. Gadot: We had a band. He’d do drums. We did some singing. Ben did the Bruce voice. It was super awesome, I’m telling you. Q: There is a message in this film to come together for the common good. Why, in 2017, is that an important message to have? Gadot: In the real world, we don’t fight monsters. We don’t have alien attacks. It’s us (humans) creating the problem. I think it would have been wonderful if somehow us, humans, could get together, come together and just be and do good to each other and try to make the world a better place. It’s a cheesy answer but I mean it from the bottom of my heart. Fisher: Also, it’s inspiring to see people with so much power who could take it in a different direction doing good. Hopefully that might inspire other people who have power to continue that. Q: Ben, Bruce has gone through a lot and has assembled these God-like beings for the greater good. How does he cope with that? 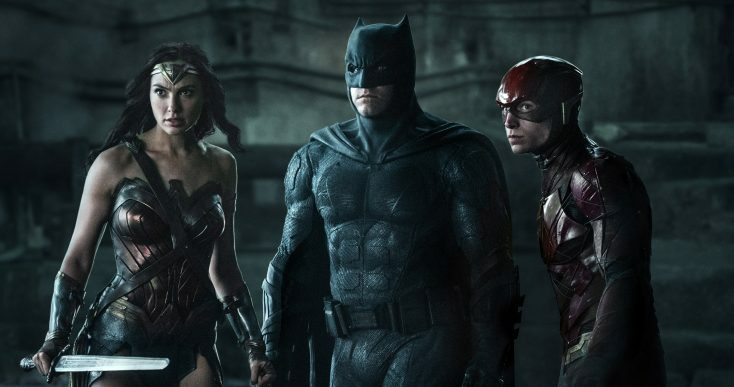 Affleck: Batman is by nature, not necessarily anti-social but a pretty private loner and in this movie he not only has to work with people but bring them together and convince them to come in there and hold that community effort together. That was a really interesting thing to play for me. It also takes us to a more traditional version of Batman in the Justice League comics, versus the less typical version we saw with “Batman/Superman” where he was blinded by rage and wanted to take on Superman. I got to have a dry wit and play off Ezra which is a lot of fun. He’s so funny and Batman/Bruce is always on the verge of exasperation. It was fun to get to show some other colors for sure. Q: Henry, how do you think audiences will relate to these superheroes? Cavill: Watching the team dynamics as characters is one of my favorite things about this movie. Superheroes are all reflections of the human psyche, human personality traits just personified and made grander. Everyone watching this movie will have something they can associate with when it comes to watching each one of these performances. Everyone will identify with the differences and similarities between characters. I think these guys really nailed it when it came to their interaction or lack of. All of them had eyes on the same goal but no idea how to get there. I think a lot of viewers will be experiencing in life anyway and these guys smashed it.